No family dentistry office would be complete without children’s dentistry. Dr. James Feigenbaum and Dr. Jenna Feigenbaum are known for their gentle techniques when treating adult patients, and they carry this approach over to the care of our youngest patients, too. Children’s dentistry can play a role in how your child views oral healthcare for the rest of his or her life; with the help of a gentle, caring children’s dentist, your child will be able to look forward to years of regular dental care without any anxiety or fear. 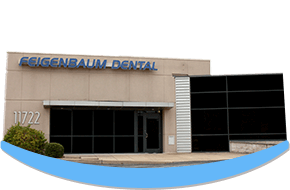 For families in Creve Coeur, MO, Feigenbaum Dental is available with complete care for patients of every age. We recommend that you bring your child to our office no later than age 3 for an initial dental visit; by this point, he or she should have most or all of his or her baby teeth, and we can make sure that his or her smile is developing well. During your child’s first visit at Feigenbaum Dental, we’ll take them around the office, introducing him or her to all the dental tools and setting his or her mind at ease about routine dental care. Children’s dentistry includes education to help your child take the best possible care of his or her smile. We’ll also count your child’s baby teeth and perform a gentle cleaning. For older kids, children's dentistry includes dental sealants and fluoride treatments. Dental sealants and fluoride treatments are commonly used to lower your child’s risk of cavities. When your child’s adult molars have come completely in, we’ll paint clear plastic dental sealants over the crevices, preventing decay-causing bacteria from hiding in the hard-to-clean spots. Fluoride treatments involve the use of a tooth enamel-strengthening mineral to make it harder for plaque to wear away at the surfaces of teeth. If your child plays sports, we highly recommend that your children’s dentistry include a custom athletic mouthguard. Major dental injuries are far too common amongst kids who play sports, but a custom athletic mouthguard created by your Creve Coeur dentist can dramatically reduce the risk.